Finally upgraded to an E6000!! Wow!! I have finally given in and bought an E6000! 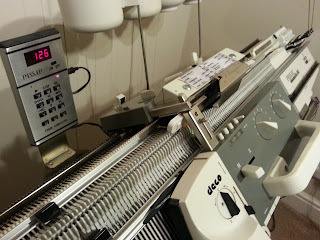 I know, another machine but I have been getting back into the whole Passap knitting again and was finding I wanted to make the best use of the Passap, and that being its patterning... jacquard etc... but I cant stand having to punch out punchcards for designs... plus one blank punchcard for a deco is fairly expensive. 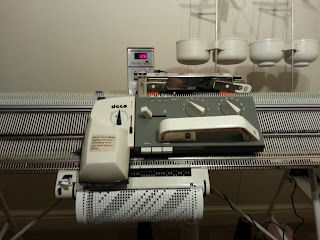 Anyway having an E6000 means I have hundreds of patterns at the click of a button! No punchcards, no punching, no hassle! 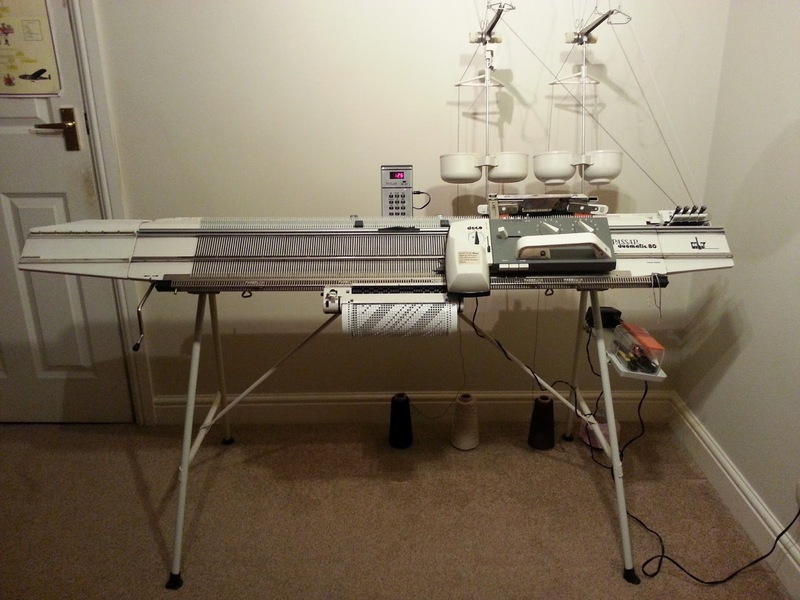 The console has surprised me and is SO EASY to use, in fact I think its easier than my Brother electric. Its quite finnicky really, it kind of asks you dumb questions that you have to answer, but on the whole I am loving experimenting with all the different in built patterns. 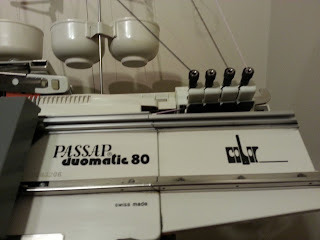 Whoever says Passaps are boring and hard work needs to get themselves on one and see just how amazing they are!!! Next step is a motor!!! How on earth does this woman cope working like this? Had a trip to Metropolitan today.... had to get my Passap colour changer fixed as two of the plastic nubs had broken off (Dont know how!) Anyway I got that sorted, but also had a demonstration of Designaknit 8 from Carol Hocknell. One word... AMAZING! 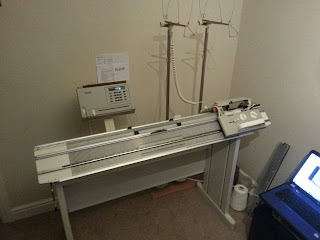 Going to be getting the software in a couple of weeks, including the cable that will allow me to knit interactively with my 965i and the software on the laptop. All the Stitch world patterns come built in the software as too do the Silver Reed patterns. Its a very clever program that I am really looking forward to learn. 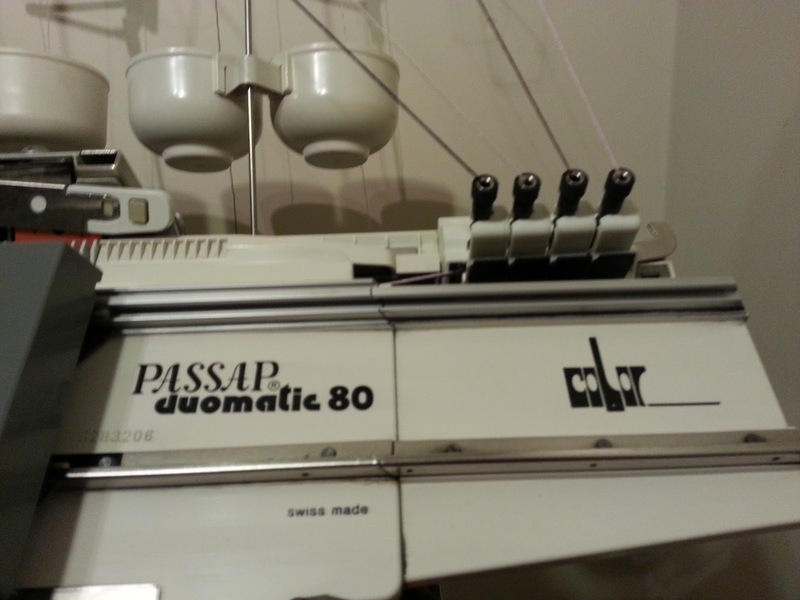 Passap Duomatic 80 - Finally got round to posting photos! 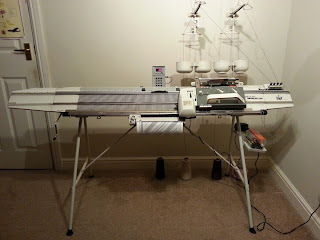 Finally got round to posting some photos of my DM80 complete with Form computer.... now to get knitting on it!!! I found Helen on flickr though and thought her projects were fantastic. She had made the above cardigan in Yeomans Cannele (Ruby) and I thought it was lovely. I contacted Helen to ask where she got the pattern and I have managed to get a copy. 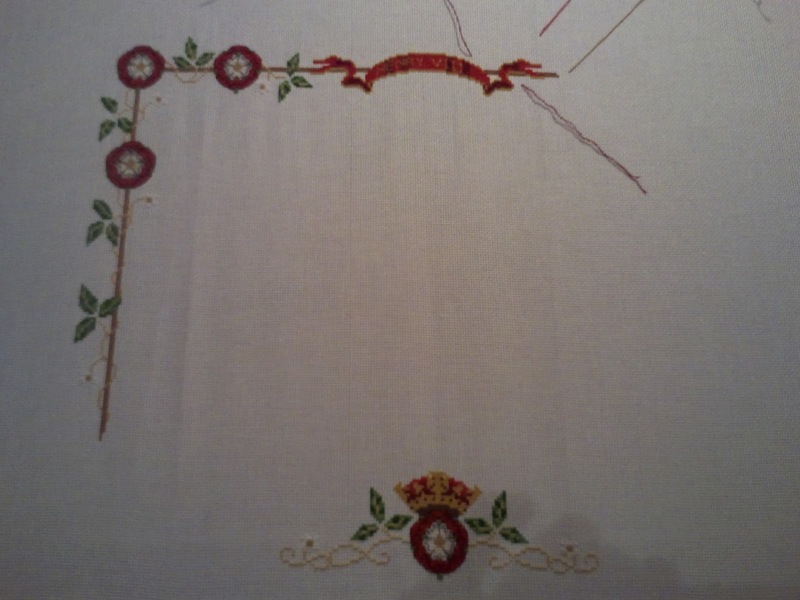 I have tonight swatched a tension square in Cannele (Linen) and cant wait to get started... however i have told myself not to start it until other projects are finished. Oh and PS I have some hand knitting on the go too....aaaaaargh!!! Knitting.... waiting for the time to! Just thought I would do an update on here as have not posted in a while. 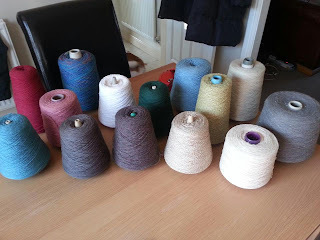 Ive not really done much knitting lately, mainly because I have started a new job at the NHS and have not really felt like it. Fail not though I am hoping to get something knitted for me soon, possibly a smart cardigan or similar and I quite fancy doing it plain black but with silver buttons. 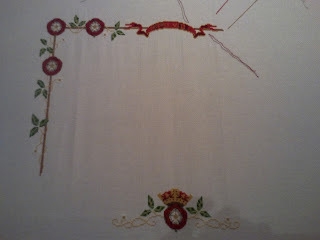 I have however been doing some more of the cross stitch I started last winter (Maybe it is turning into a cold winter night project?) So I have included a photo of my progress below. Hope to post again soon. Baby garments and Ginny Giraffe! My sister's best friend gave birth to a beautiful baby girl last Friday 31st August, she was named Daisy Eva. 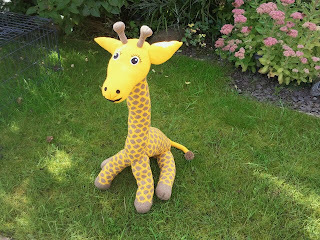 I wanted to make something "different" to my usual cardigans and sweaters so I decided to make a toy - I had not intended on making a 1 metre high toy though! Daisy's mum loves giraffes and I came across this pattern in amongst some patterns Carol Hocknell had given me when I bought my Passap back in June. Ginny as I have named her has knitted up beautifully and she is knitted in Uppinghams 2 ply Lambswool - so rather special! She is SO SOFT! I also made some baby clothes too... a baby coat knitted in 4 ply acrylic and a fairisle V neck vest knitted in my own hand dyed pure wool. Will put some photos up of these in the next few days. 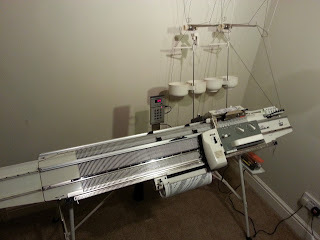 I'm an avid machine knitter, I have a problem collecting machines. I like to design my own knitwear rather than follow patterns.